Understanding KPIs for Restoration Contractors - Next Gear Solutions, Inc. Break down your data to build your business. It's your data. Put it to work. 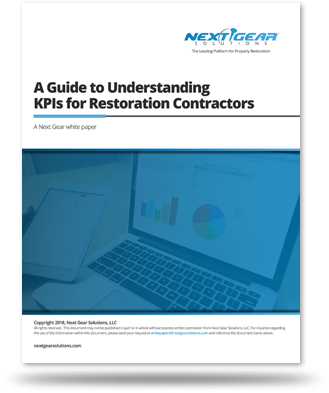 Our white paper - A Guide to Understanding KPIs for Restoration Contractors - is intended to shed light on the often overlooked business data that's waiting to be harnessed and transformed into a performance enhancing tool for your company. Most restoration businesses today have access to some type of data that can be used effectively to manage their operations and set goals. However, most businesses cannot properly aggregate data into a format that can be used efficiently to set specific goals or company wide objectives. Before we dive into the topic of Key Performance Indicators (KPIs), it is important to understand some of the nuances that exist between data, metrics and KPIs. KPIs can be used in an actionable scorecard that keep your business strategy on track. They enable you to manage, control and achieve desired business results. This white paper will cover how to break down the data from your business, how to identify different types of measurable data, how to identify meaningful KPIs, how to manage those KPIs, and how to utilize those KPIs by using VPASS Performance Scoring.